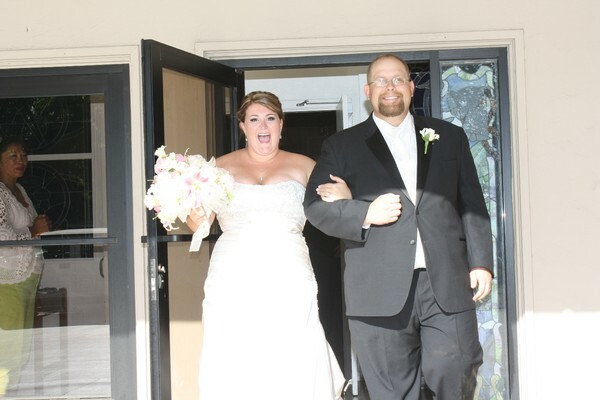 Sara & Jarod exit the church on their wedding day. There isn’t a doubt in our minds that Ruethai Steve Allard isn’t just the best DJ’s in the world but one of the coolest people that you could ever meet. There isn’t a person in this world that we would of trusted more with our ceremony and reception. His professionalism is far exceeding expectations and his personality and presence on the microphone is second to none. When we started the process of planning our wedding he was the only guaranteed must have after we saw him at another wedding. Personally we don’t know how Ruethai can always be at the top of his game it like he is some sort of machine. Thank you Ruethai and hopefully we will see you at our friend’s future weddings so we can party it up again real soon.